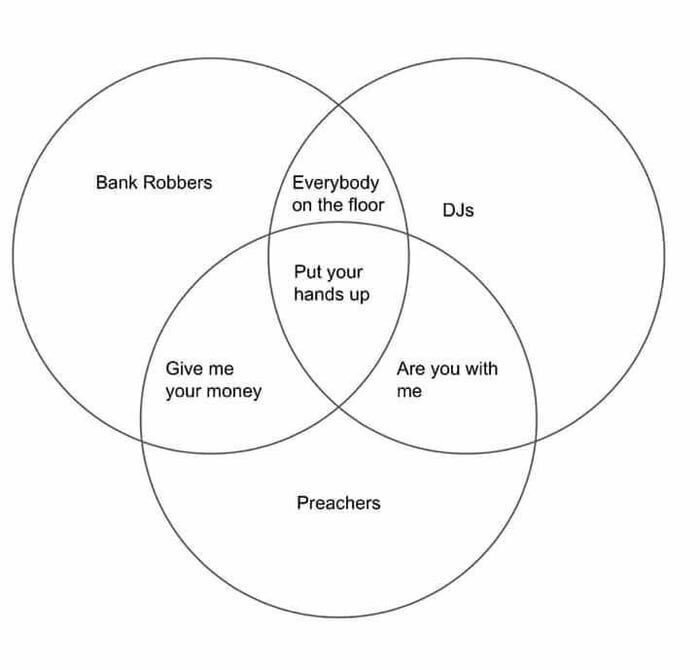 I think this Venn diagram is hilarious. DJ: For the past 21 years, I have owned and operated a DJ company, performing more than 400 weddings and other events. Preacher: Last year, I delivered a sermon at two different churches in Massachusetts, and next month, I will do so again at the Universalist Unitarian Church in Groton, CT. I’ve also married more than two dozen couples and conducted baby name ceremonies in my capacity as minister. Bank Robber: In 1991, I was arrested and indicted on charges of grand larceny after a deposit of $7,000 went missing from the McDonald’s where I was working. Though my supervisors at McDonald’s did not believe that I had stolen the money and did not press charges, the police pressed charges on behalf of the insurance company. In an effort to determine if the deposit bag might have been stolen from the bank’s night drop slot, my boss, Hope, and I attempted to steal deposits from the night drop using high test fishing line, wire coat hangers, hooks, and a magnet. The results were less than spectacular. We were unable to extract a single deposit from the drop, and our repeated attempts resulted in about $5,000 in damages to the night drop mechanism. Though I failed in my attempt, I was a bank robber for a moment in time. Also, what the hell were we thinking?